Featured below is an interview with another #SoCanU project rockstar, Febin! 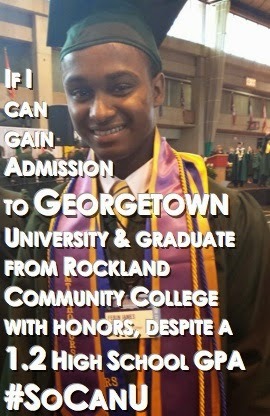 Febin graduated from SUNY Rockland Community College in May 2014 and will be transferring to Georgetown University to pursue a bachelor's degree in finance this fall. Favorite thing to do on the weekends? I love to play basketball, work out, and spend time with friends & family. I love Indian food, especially chicken tikka masala with naan bread! What made you decide to choose community college? After a period of deep soul searching, I decided that it was best to pursue an Associate’s Degree and transfer into a four year college. That was the first, and by far the best option that was available to me at the time and I am more than happy that I made that decision. SUNY Rockland offered an outstanding education at an affordable price as well as a strong, diverse community in which I could thrive both academically and socially. The endless opportunities that SUNY Rockland provides over other local community colleges were more than enough reasons to enroll. Were there any obstacles in your life prior to attending community college that you had to overcome? When I was 12 years old, I moved to Monroe NY and carried a lot of bad habits throughout my middle school and high school years. It really shaped who I was as a student. I was really unmotivated as far as what I wanted to do with my life, and I graduated high school at the bottom 10% of my class, with a 1.2 GPA. Although the transition from high school to college was arduous, I quickly found myself surrounded by mentors who took me under their wing despite my regretful high school record. With their guidance, I earned a 3.5GPA and enrolled in the nationally recognized Mentor/Talented Student Honors Program. I made a decision to change my life around and not only prove to myself that I can succeed, but to prove to all of the naysayers who tried to put me down. This served as my motivation to excel in my schoolwork and get on the path to a bright future, and is precisely what keeps me going through the long nights of studying hard and pushing myself. What obstacles did you overcome in community college and/or in your transfer university to achieve your degree? Throughout the fall 2013 semester, my father was hospitalized after suffering a stroke. During that semester, seconds felt like hours, days felt like months, and months felt like years. Over those months, I transformed into a surrogate father figure from cooking meals for my family, to working endless hours at a retail store to help my mother pay the bills. This experience forced me to quickly snap out of my “high school mind-set”, be mature, and step up to the plate to become the man of the family and care for my mother. I came to the realization that there were lessons to be learned from his absence, as I was able to experience a role few could share or understand. I belonged to a different world now, a world of leadership and responsibility and was able to overcome this obstacle that could’ve negatively affected my academics. 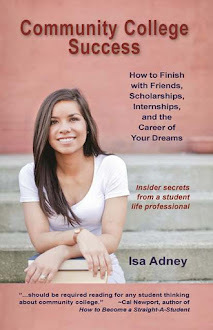 What is one of the most important things that helped you succeed in community college and beyond? Throughout my time in SUNY Rockland Community College’s M/TS Honors Program, I’ve learned how to multi-task and balance a rigorous honors program cirriculum and volunteering/working outside of school, while concurrently serving as the President of Alpha Beta Gamma International Business Honor Society, President of the Economics Club, Vice President of Leadership at Phi Theta Kappa International Honor Society, Vice President of Just Save One RCC, as well as being a peer mentor and a tutor on campus. I’ve learned how to balance everything out and it sharpened my time-management skills significantly. This has been one of the most important things that I’ve learned at SUNY Rockland Community College. What are you most excited about for your future right now? I am really excited to spend the next few years of my life at the nation’s capital. I feel as if I am on a mountain overlooking my future. Georgetown is going to allow me to reach my full potential and grow as a person. It has been my dream school since I joined the Honors program at SUNY Rockland Community College. What is the best piece of advice you can give our readers who are currently attending community college?